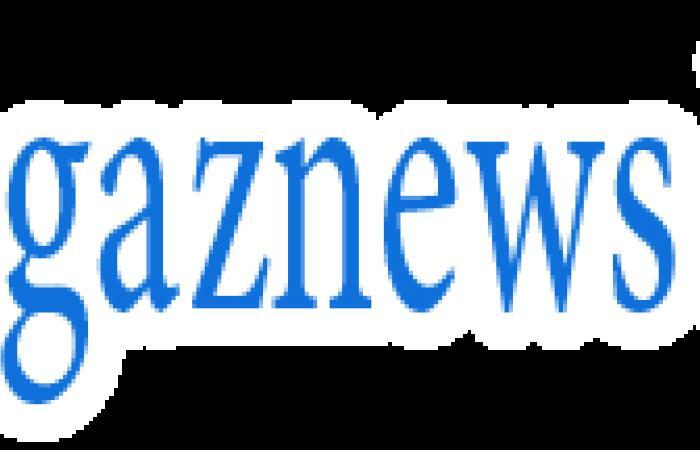 After dealing with the agony of the shadowy affair George Bush reputedly had with Jennifer Fitzgerald for twelve years, the brusqueness and cattiness of Nancy Reagan was a piece of cake for Barbara when George served as Ronald Reagan's vice president. 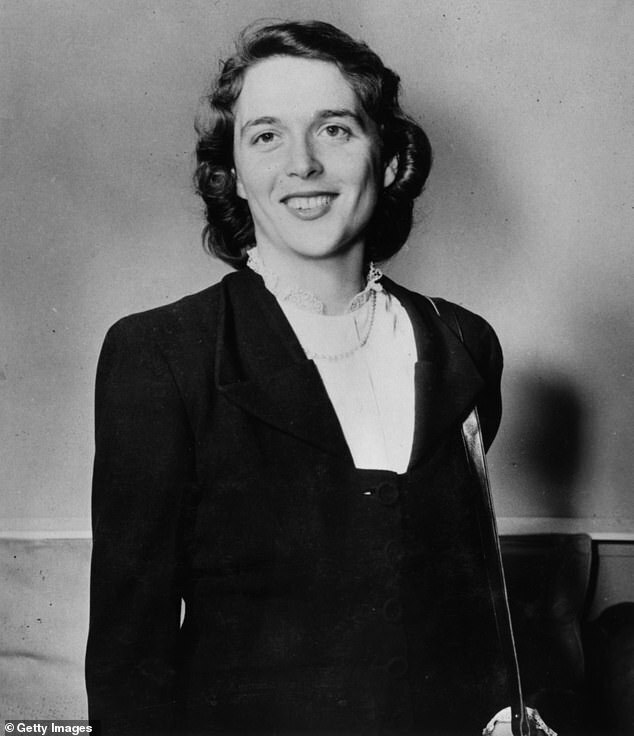 Nancy Reagan set the highest disapproval rating for any First Lady up to her tenure and only Jackie Kennedy scored higher favorable ratings than Barbara Bush. 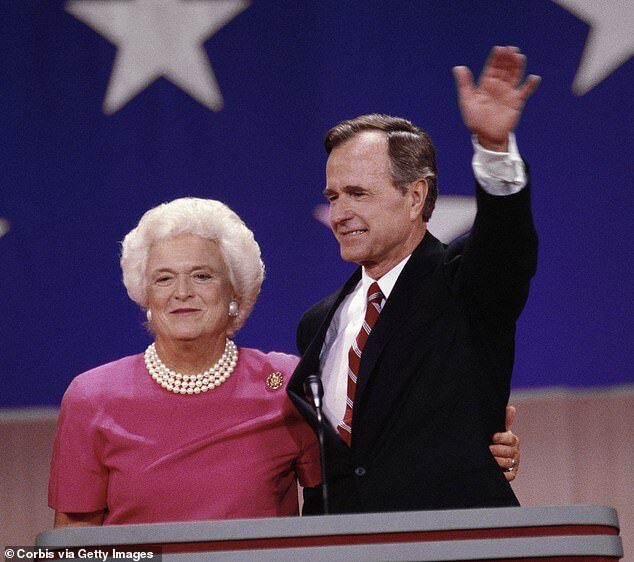 'My mail tells me a lot of fat, white-haired, wrinkled ladies are tickled pink', stated Barbara Bush. Spotlighting her flaws she said, 'I think it makes them feel better about themselves'. 'Barbara Bush presented herself as America's grandmother, comforting and comfortable, although in fact that was just one dimension of her complicated persona', writes the author Susan Page in The Matriarch, Barbara Bush and the Making of an American Dynasty out on Tuesday. But it was Barbara's grandmotherly veneer that made Nancy seethe when she served as First Lady. She hoped Barbara would change the way she dressed, do something more glamorous with her hair, and wear some makeup. On her exit, Nancy had no First Lady advice for Barbara but 'she sniffed that the job was considerably more difficult than being Second Lady', writes Susan Page. After Nancy was long gone back to California, she took one more dig at Barbara's fashion sense in her memoirs. She wasn't through with 'the Shrubs', as she called the Bushes. Barbara's mother, Pauline Pierce, was tough on her younger daughter and thought Martha, Barbara's older sister, had hung the moon – being tall and thin unlike Barbara who always struggled with her weight because she loved to eat. At age twelve, Barbara tipped the scales at 148 pounds and was chided by her mother that she weighed a hundred pounds at birth. When her younger brother, Scott, broke his collarbone, doctors discovered a cyst on the bone of his right arm. It required five operations and bone transplants that consumed Pauline's attention as well as increased her discontent with her lot in life and burdened the family with major financial repercussions. Barbara decided early on, 'You have two choices in life: You can like what you do, or you can dislike it. I have chosen to like it', the author quotes Barbara. She fell madly in love with George, the first man to kiss her and confessed, 'I didn't know a damn thing, and he trained me, truthfully', Barbara told he author. 'I was so stupid. I didn't know anything, and he took care of me. 'He grew me up'. Barbara was on board for George's decision to leave the wasp enclave of Greenwich, Connecticut and head out to the wilds of West Texas to get into the oil business. Barbara's mother died unexpectedly in a car accident. She had been sipping tea in a cup and placed it on the car seat. Her father, seeing that it was going to spill, reached out to move it and lost control of the car. The car went over an embankment and struck a tree killing Pauline instantly. Barbara did not go home for the funeral and her feelings towards her mother remained unresolved and left her with lifelong insecurities. She had a different approach to child-rearing and remained dedicated to her immediate family. She found the strength after much weeping to forge ahead when their first child, Robin, was diagnosed with leukemia at age three and succumbed to the disease after their valiant attempt to save her life. 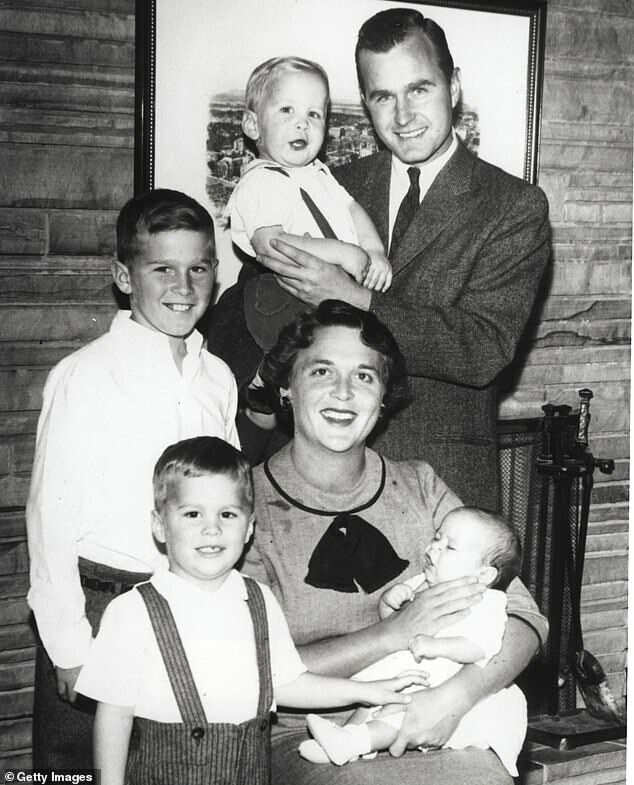 George W. was born next and Barbara suffered a miscarriage before four more children followed. It was a time of 'long days and short years of diapers, runny noses, earaches, more Little League games than you could believe possible.....and short chubby arms around your neck and sticky kisses', Barbara told the author. But she loved every minute of it and became known in Midland, Texas 'as 'one of those supermoms, the commander in chief of her brood'. With George often on the road, it was a matriarchal family and Barbara was taking care of the nest that included 'five rambunctious children and an ambitious husband'. George gone so often did cause her 'some pain and jealousy. I just didn't think there was enough time for us', she confessed to Susan Page. But she recognized that George had political ambitions for years. President Richard Nixon appointed him as Ambassador to the United Nations in 1971 and he was off and running after serving in the House of Representatives from Texas's 7th congressional district. It was an urban myth that Barbara's hair turned white overnight after their daughter Robin had died, the story first appearing in news stories in 1988. In truth, Barbara was thirty-five when she saw signs of graying and started to dye her hair. Swimming laps in a chlorinated pool for exercise turned her hair green. She had tried a rinse called 'Fabulous Fawn' while campaigning for George in 1970 and when the air-conditioning quit working on the plane, the hair coloring started to trickle down her neck. Barbara decided to let nature take its course and went with the concept that 'what you see is what you said', she stated years later. 'People who worry about their hair all the time, frankly are boring'. 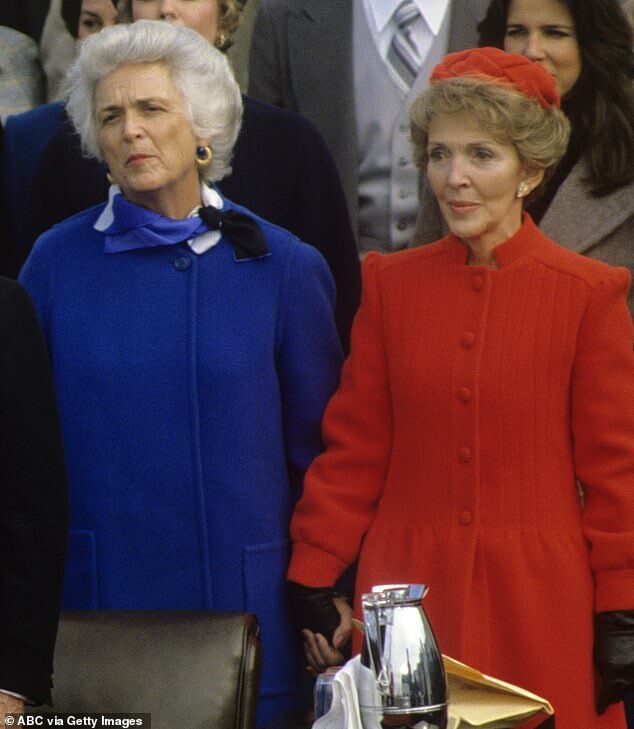 It was just that attitude that vexed Nancy Reagan who was amazed that Barbara didn't bother to dye her hair. Nancy was disdainful that Barbara didn't worry about her figure, wear any makeup other than a slash of lipstick or do something about the wrinkles in her face. 'Nancy also was envious of Barbara's self-confidence, her social standing, and her close-knit family, attributes that hit Nancy at some of her greatest vulnerabilities', writes the author. Barbara knew that she would never win in Nancy's eyes. 'I think she just was insecure', Barbara told Susan Page in one of many interviews. Barbara returned the disdain and considered Nancy 'brittle and shallow, and as a mother who had failed to forge a close or even functional relationship with her children'. But Barbara was conscious of and admired Nancy's slim figure, the way she wore designer fashions and the adoration of Ronnie, who preferred being home along with Nancy – while George was so often away and embroiled in salacious rumors that wouldn't quit of an affair. Barbara was envious that Ronnie wanted to only be with Nancy. 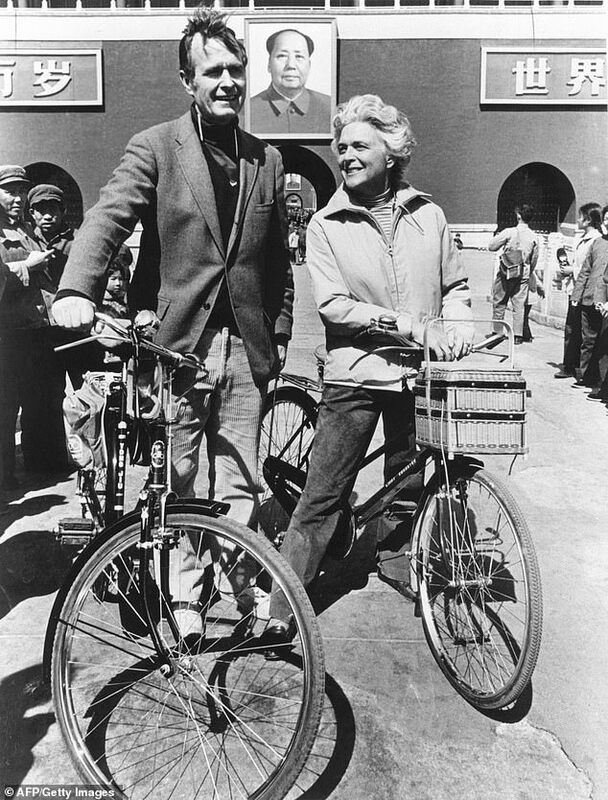 The Bushes were not Texans by birth but they were charter members of the eastern establishment, the very definition of WASP. 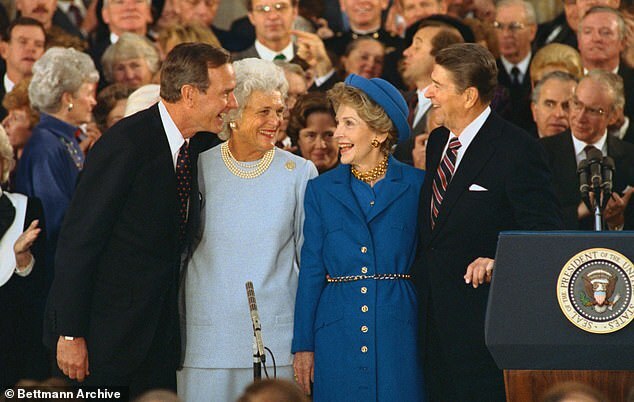 The Reagans were viewed as outsiders from the other coast and dismissed by some in the tony Georgetown WASP set who dismissed Reagan 'as a right-winger and as an actor playing a role'. 'An amiable dunce', stated Clark Clifford, an adviser to four presidents. When the press asked Barbara about the relationship between the two women, she stated, 'None of us really know each other yet. 'We're sort of like new dogs, sniffing each other out'. The comment had to appall the very formal Nancy. Barbara tried for a comeback saying she found Nancy 'ravishingly beautiful. 'When we were with them, I could hardly take my eyes off her'. 'Nancy is a size four and I'm a size forty-four'. 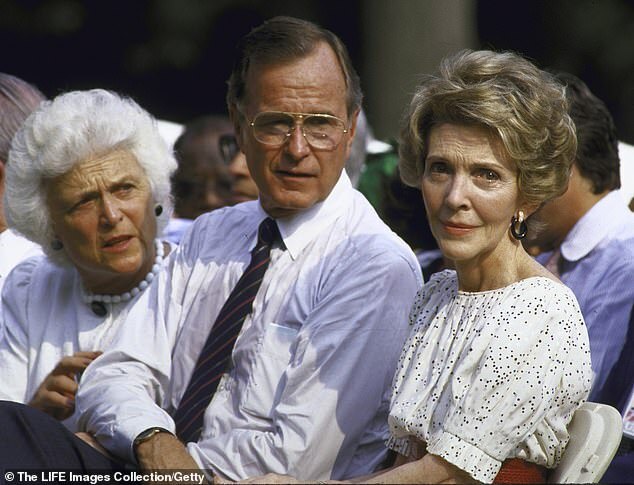 But that didn't melt the big chill between the two ladies and the Bushes couldn't understand why the relationship with Nancy was so problematic.